Is your stash bursting with 1930s prints? You know, collections like Lazy Daisy Baskets, Grandma's Garden, and Betty Dear? 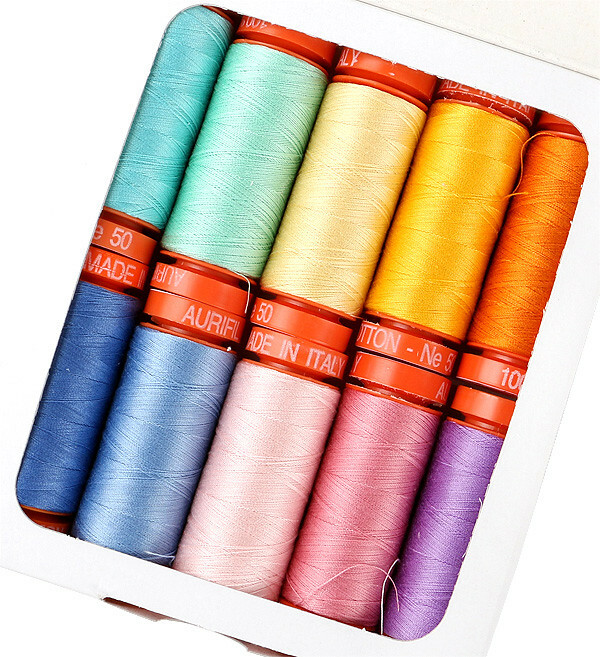 Darlene Zimmerman's new thread boxes by Aurifil Thread might be the perfect addition to your bright, colorful stash. These threads will match perfectly for your vintage-inspired applique and binding. We are giving away FOUR Darlene Zimmerman Thread Boxes to FOUR lucky winners! We have two Darlene Zimmerman Large Aurifil Thread Boxes and two Darlene Zimmerman Small Aurifil Thread Boxes up for grabs today! First up, we have two Darlene Zimmerman Large Thread Boxes to give away. 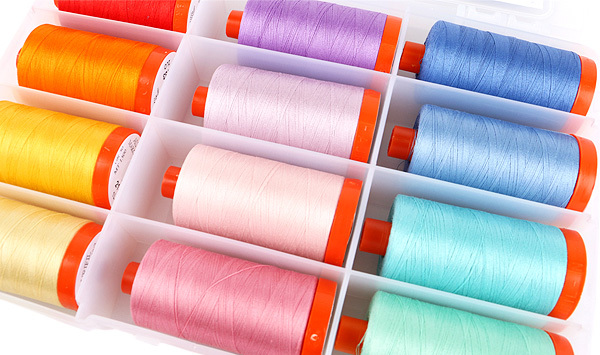 These boxes contain 12 playful thread colors to perfectly accompany any 30s-inspired project. Each spool contains 1,422 yards of delicious 50 wt. 100% cotton thread. With all of that thread, you might have to dig through your stash and start an applique project or two. The Candy Store and More book by Kay Connors and Karen Earlywine might give you just the inspiration you need. And next up, we have two Darlene Zimmerman Small Thread Boxes to give away. This little beauty is travel-friendly, and contains 10 spools of Darlene's charming thread colors. If you want a taste of this adorable thread collection, the Small Thread Box is for you. The 10 spools contain 220 yards of 50 wt. 100% cotton thread. For a chance to win these playful thread boxes, leave a comment on this blog post letting us know what 30s-inspired projects you have in mind for these silky smooth threads. Four winners will be chosen on Friday April 25th. Eligibility is open to all, and please only comment once! Be sure to include your email address so we know how to contact you! Good luck! Aurifil winners UPDATE! Congratulations to our winners! I want to do a dresden plate quilt in 30's fabrics. I am collecting a few every time I go to a quilt shop. Thanks for the chance to win. Hermosos hilos, hermosos colores! Los voy a utilizar en cualquiera de los proyectos que tengo en mente, un bolso, un edredón, cosas de navidad... es que en mi país no se consiguen fácilmente. Seré muy feliz de tenerlos en mis manos. Gracias y abrazos desde Colombia!